Walter Laquer is one of an older generation of European-born thinkers who have thrived in the United States in the post-World War II era, becoming part of our think tank-academic establishment. Born in Germany in 1921, Laquer left the country in 1938. His less fortunate parents stayed behind and perished in the Holocaust. He has held distinguished positions in Great Britain as well as the United States; has written extensively on 19th and 20th century Europe, specializing in Russian and Germany history; and has taught at numerous prestigious institutions, among them Brandeis, Georgetown, Harvard, Chicago and Johns Hopkins. But for all this gravitas, I found Laquer’s “After the Fall: The End of the European Dream and the Decline of a Continent” disappointing. I won’t blame Laquer for the overwrought sub-title: that could well have been an editor or publisher’s choice, based on marketing considerations. But while the “decline of Europe” is a much-discussed subject on both sides of the Atlantic, I did not find many fresh thoughts or new insights on the subject here. 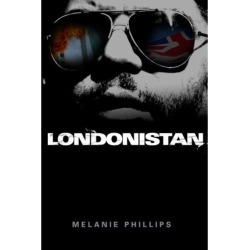 The book is a follow up to another by Laqeur with an equally gloomy title, “The Last Days of Europe: Epitaph for an Old Continent,” published in 2007, whose ostensible purpose is to provide an overview of Europe’s fate as the extent of the global economic crisis became apparent. Euro-pessimism pervades “After the Fall.” Figuratively, Laquer argues, after Sir Edward Grey said the lights were going out in Europe in 1914, they have never since gone on again. 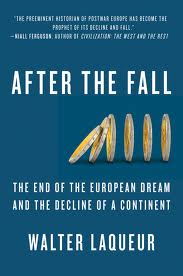 The decline of Europe is not only “inescapable” and “inevitable,” it has “already taken place” (p.281), he asserts. Previous futurists who foresaw Europe’s decline were dealing in prophecy and speculation, whereas today’s declinists “are dealing with developments that, for the most part, have already happened” (p.273). At another point Laquer suggests that 2000 was Europe’s “last good year” (p.189). A constant refrain throughout the book is that Europe is in the process of becoming a large historical theme park, a “kind of sophisticated Disneyland for well-to-do visitors from India and China” (p.80). Against this dispiriting backdrop, Laquer advances four main themes. The first two involve the weakness of the European Union: it was a mistake to form an economic union in Europe with little political power behind it; and the EU has no real military power, and therefore cannot aspire to be a serious player on the world stage. The third and fourth concern Europe’s changing demographics: Europe’s native white population is declining across the continent, and it’s non-white population is increasing, especially its Muslim population, with all the challenges to integration which that raises. These demographic changes also pose a direct and immediate threat to Europe’s generous welfare systems. To Laquer, the experience of the recent past and the lesson to be drawn from the 2007-2009 economic crisis and its aftermath should have been obvious from the beginning: an economic union was impossible “without a far larger measure of political union. But this would have involved a price that many did not want to pay – the surrender of hitherto sovereign rights” (p.268). From the beginning, moreover, it was a serious mistake for Europe to assume that “there could be power without military strength. Such delusions were bound to lead Europe down the road to irrelevance” (p.74). For the EU, the common defense is not the muscular term used, for example, in the United States or Israel, but rather a “synonym for preventive diplomacy, always with the assumption that such interpretation would be shared by all others” (p.57). In contrast to powerful America, willing to exercise its power unilaterally if necessary, Europe sees its mission as “spreading the gospel of law, civilization, and eternal peace” (p.157). Even in the exercise of “soft” diplomatic power in promoting democracy and the rule of law outside Europe, the EU has been “high on rhetoric, [but] its achievements are less than modest” (p.75). Demography plays no small role in Europe’s decline. Laquer notes that Europe contained 25% of world’s population in 1900, 12% in 1950, and is projected to be about 5-7% in 2050. There is no reason to think that there will be any reversal of declining birth rates in Europe. Despite occasional upticks, the “basic trend is downward, and while a radical turnaround is always possible, it is difficult to even imagine its causes. . . By and large, the predictions of the demographers have been accurate with only a minor degree of error” (p.200). Throughout Europe, there will soon be more people over 60 than under 20. But any discussion of the declining demographics of Europe also needs to address non-white immigration into Europe, which in this book mostly means Muslim immigration. 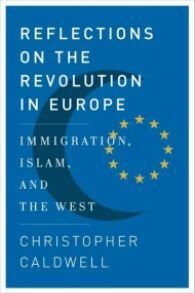 At times, Laquer seems apoplectic about the consequences of immigration for Europe, arguing that the influx of immigrants at a minimum is “leading Europe to a profound crisis” and, combined with other threats, “almost certainly means the end of Europe as a major player in world affairs” (p.229). Although pointing out that Europe’s Muslim population is “anything but monolithic” (p.255), Laquer emphasizes that Islamic immigration into Europe has been mostly among its backward and uneducated elements, not the young and educated. For a variety of reasons, the second and third generation of young Muslin immigrants, who might be expected to integrate, all too frequently have “revolted against their country of adoption” (p.210). Laquer downplays the notion of European “Islamophobia,” widespread antipathy toward Muslims across the continent. The attitude of Europeans toward Islam is one of “indifference rather than enmity,” (p.196), he concludes. Europeans’ feeling of “becoming strangers in their own country” (p.140) is the main reason for tension with Muslims, not hostility to Islam. Violence against Muslims is rare in Europe, compared with violence of young Muslim immigrants toward Jews and non-believers in such countries as Sweden, France, Belgium, and the Netherlands, he contends. regain economic momentum; its countries must cooperate far more closely with one another inasmuch as Europe’s foreign and defense policy is concerned, to understand the limits of civilian power in the world of today and tomorrow. This will be a painful process, and it is not certain whether Europe and the Europeans have the will and the strength to undergo it (p.279). Laquer treats the subject of an ailing Europe intelligently, and his book may be a good primer for readers who seek an overview of its contemporary challenges, written from the perspective of an author who regards the continent as an increasingly irrelevant entity in the 21st century. I am predisposed to think that reports of Europe’s death are greatly exaggerated, much like those of Mark Twain that reached the living writer, but must of course remain open to arguments to the contrary. This book might be compared to an opening statement at trial, in which Laquer sketches out his main arguments for Europe’s irreversible decline, but with a more extensive presentation of facts and weighing of evidence needed before a judgment may be reached.